You will need to be careful to protect your new joint after hip replacement surgery. Along with doing your physiotherapy exercises, there are many things you can do to help your hip heal. Your recovery may be faster if you follow these precautions. Try to keep your hip within the safe positions while it heals. Some leg and foot movements may increase the risk of dislocating your hip. Try to avoid those positions. Keep your toes pointing forward or slightly out. Don't rotate your leg too far. Move your leg or knee forward. Try not to step back. Keep your knees apart. Don't cross your legs. 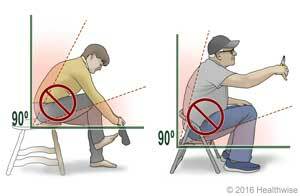 Don't lean forward while you sit down or stand up, and don't bend past 90 degrees (like the angle in a letter "L"). This means you can't try to pick up something off the floor or bend down to tie your shoes. Don't lift your knee higher than your hip. Don't sit on low chairs, beds, or toilets. You may want to use a raised toilet seat for a while. Sit in chairs with arms. Imagine there's a line running down the middle of your body. Keep your legs from crossing over it. Don't cross your legs when you sit. Don't cross your ankles while lying down. It may help to keep a pillow between your knees when you're in bed. When you get into a car, back up to the seat of the car, and then sit and slide across the seat toward the middle of the car with your knees about 12 inches apart. A plastic bag on the seat can help you slide in and out of the car. Step up first with your unaffected leg. Then bring the affected leg up to the same step. Bring your crutches or cane up. To go down stairs, reverse the order. First, put your crutches or cane on the lower step. Then bring the affected leg down to that step. Finally, step down with the unaffected leg. You can ride in a car, but stop at least once every hour to get out and walk around. You may want to sleep on your back. Don't reach down too far to pull up blankets when you lie in bed. If your doctor recommends exercises, do them as directed. Cut back on your exercises if your muscles start to ache, but don't stop doing them. Severe pain and not being able to stand. A crooked leg that looks like your hip is out of position. Not being able to bend or straighten your leg. Your leg or foot turns cold or changes colour. You have tingling, weakness, or numbness in your leg or foot. Your incision opens and starts to bleed, or there's more bleeding. You do not have a bowel movement after taking a laxative. Enter A959 in the search box to learn more about "Hip Replacement (Posterior) Precautions: What to Expect at Home".